Tilda Swinton is a British actress who has performed in over 70 films. She has been nominated for numerous awards including an Academy Award, BAFTA Awards, European Film Awards, Golden Globes, Screen Actors Guild Awards, Saturn Awards, and others. Among the awards that she won are a European Film Award for Best Actress (2011 – We Need to Talk About Kevin), two BAFTA Awards for Best Actress in a Supporting Role (2007 - Michael Clayton) and Best Actress in a Leading Role (2003 - Young Adam), and an Academy Award for Best Supporting Actress (2007 - Michael Clayton). Tilda Swinton’s ancestry is loaded with royalty. She’s a direct descendant of King Edward I and has family connections to King Henry VIII and at least four of his wives. She also has ties to the current royal family through the late Princess Diana, the Duchess of York Sarah Ferguson, and the Duchess of Cornwall Camilla Parker Bowles. Her U.S. Presidential kin include George Washington, Thomas Jefferson, James Madison, John Quincy Adams, William Henry Harrison, Zachary Taylor, Benjamin Harrison, Rutherford B. Hayes, Grover Cleveland, Theodore Roosevelt, William H. Taft, Herbert Hoover, Franklin D. Roosevelt, Richard Nixon, and both Presidents Bush. 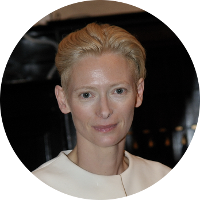 Fellow celebrities that are found in Tilda Swinton’s family tree include Guy Ritchie, Hugh Grant, Johnny Mercer, Ted Danson, Ann Baxter, Paget Brewster, Joanne Woodward, Tennessee Williams, Walt Disney, Katharine Hepburn, and numerous others.